The good part of the story is that this mother’s Facebook friends appear to have a balanced sense of right and wrong. As soon as the disturbing photos were posted to Facebook of a mother calling her child “her new pet,” they went viral for all the wrong reasons. Facebook users were outraged, and authorities in the Philippines vowed to track the woman down. Here’s the other thing about social media most of us conveniently forget: A social networking site like Facebook has location data, making it easy to track you from where you posted. Based on this information, authorities found that the toddler and his mother came from Bataan. The alarming post went viral on Monday. The mother was located by the Philippine National Police and the National Bureau of Investigation within 24 hours and taken into custody for psychological evaluation. The woman behind the photos was identified as Ayra Dela Cruz Francisco. The Philippines Daily Inquirer reports that the child, seen on a leash being treated like a dog, has been rescued and taken into temporary custody. The young boy is being held at the Reception and Study Center for Children, a facility that houses abandoned children. Secretary Soliman is adamant in calling this act a serious offense, saying that whoever took the picture has no business taking care of a child. 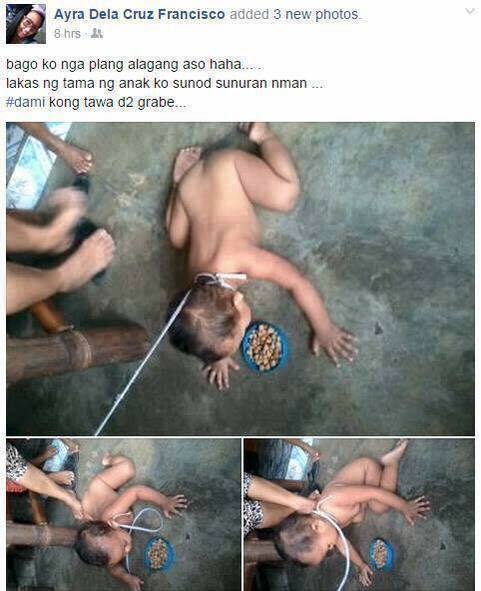 The mother defends these sick pictures by saying that the toddler was simply mimicking the family dog, and a relative tied a shoelace around the child’s neck as a joke. Even if everything this mother said is true, and the act really was a joke gone wrong, there is a split second here when her sane parenting brain could have kicked in. She could have found it offensive that a relative tried to put a leash on her child pretending to eat out of a dog food bowl. She could have put a stop to it immediately. She could have deleted the pictures instead of posting them to Facebook. Jokes like this, where an impressionable child is treated like an animal, just aren’t funny, no matter how you try to spin it.